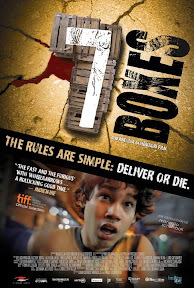 A highly effective do-it-yourself low-budget foreign indie thriller, 7 Boxes is largely set in and around a busy marketplace in the mean streets of Paraguay that are overcrowded with wheelbarrow “pushcart” drivers hustling as fast as they can to make a buck moving a wealthy shopper’s merchandise from one place to another. Pulsating with life and urgency, Boxes is proof that to this day, there’s no greater device for creating suspense than letting a Hitchcockian MacGuffin slowly heat until it’s naturally brought to a full boil. Using the set-up that made Luc Besson’s Transporter series work so well (in that much like those pictures, sometimes these kids have no idea what they’re transporting), this fast-paced work also has traces of Run Lola Run, City of God and Requiem for a Dream in its varied cinematic DNA. 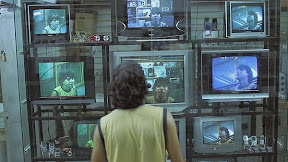 The feature filmmaking debut of Juan Carlos Maneglia and Tana Schembori, Boxes takes a simple premise and keeps building onto it until the taut narrative threatens to collapse under the weight of its heavy structure. Yet to our immense pleasure as an audience, the film never falls apart, despite almost losing us a few times as we struggle to take everything in – reading subtitles while trying to keep track of its many supporting characters, twists and revelations that link one person and subplot to the next – at its breakneck speed. And while of course we wish it would slow down occasionally to let us catch our breath (and indeed to fully appreciate the intricacies, ironies and intelligence of the feature, you’ll need to view it at least twice), had the filmmakers suddenly changed the rhythm, the movie would’ve lost its magic. Understanding that in the world of Boxes, time is money and if you snooze, you lose, we follow the characters on their chaotic journey from the heat of the afternoon overnight until we discover who’s left standing the next morning in this masterful street saga. 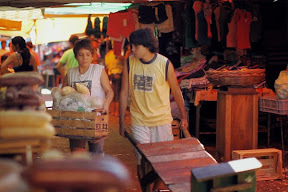 Money... or more importantly the promise of what he can achieve or obtain with money is what initially motivates our seventeen year old hero Victor (Celso Franco), a pushcart driver who dreams of one day seeing his own reflection staring back at him as an actor on the television screens he covets while delivering customer’s goods in Paraguay’s Mercado 4. Tempted by the sale of a used cell phone boasting a built-in video camera that’s being flipped by the boyfriend of his sister’s pregnant coworker, Victor steps his pushcart efforts into high gear, accidentally winding up in the wrong place at the right time when the local butcher’s shop offers Victor an unusual proposition beyond his wildest dreams. Fearing the local police inspectors, the back room butcher employees pile seven mysterious boxes onto Victor’s cart before ordering him to wheel it out of sight and guard the merchandise with his life. Given one half of a ripped one hundred dollar bill and promised the rest on his safe return, Victor eagerly obeys, realizing shortly after that there’s a reason the deal seemed too good to be true once everything starts to go very, very wrong. Hunted by the man who’d originally been promised the illicit gig and also drawing suspicion from police and thieves alike, Victor enlists a friend’s help as the elements of the underworld begin to rise to the surface. Knowing that he’s involved in something illegal, it’s only the deeper he gets caught up in this seemingly endless task that viewers begin to piece together the shocking truth behind what’s really in those seven boxes and how many people are involved in an unspeakable crime. A staggering achievement, 7 Boxes is an action-packed rollercoaster that’s filled with moments of breathtaking suspense – sometimes captured directly from Victor’s point-of-view in a Darren Aronofsky-like Requiem approach. But what’s even more impressive about this Paraguayan record-breaking box office smash is the level of human drama that the co-directors and writers are able to layer naturally throughout what could've been a formulaic thriller plot. As one character leads us to another, we’re treated to a richer narrative that shows us a much more complicated side to the marketplace – touching on everything from socioeconomic struggles to surprising opportunities for comedy, emotion and endless twists. Moreover, the setting of the film becomes its own allegorical stand-in for international relations and culture clashes including a fascinating subplot that develops between Victor’s sister and the Korean son of her restaurant owner employer as the two teens rush to help her friend delivery her baby before getting caught up in Victor’s dangerous endeavor. An impressive discovery from a talented filmmaking duo, the work which has garnered praise and accolades at festivals around the globe has finally arrived stateside two years after its screen debut. And similar to Victor’s promise to cart the boxes in the hopes that it will lead to superstardom, you shouldn’t pass up the opportunity to discover this can’t miss disc (before the rest) in order to help spread the word – delivering Paraguay’s stellar Boxes to adventurous filmgoers in dire need of something cinematically fresh.